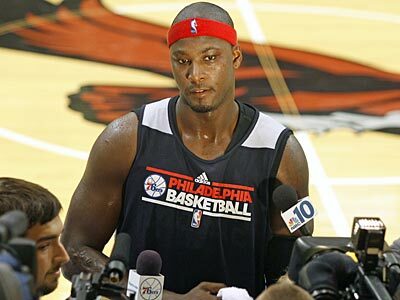 Waived by Sixers, where does Kwame Brown land next? Kwame Brown is on the move again, but where he will sign next remains a mystery. On Wednesday, the Philadelphia 76ers waived the former No. 1 overall draft pick in 2001 along with Darius Morris, and Brown's departure can be rooted in the final months of last sesaon when Brown did not appear in the final 30 games for the Sixers. Although he was healthy during that stretch, this season Brown has been sidelined with an injured hamstring and did not step on the floor for Philadelphia. Now, Brown has stepped out of Philly with his bags packed. "Kwame's injuries got the better of him," said head coach Brett Brown. "Through his injuries, he was never really able to get on the court. We wish him well. I'm convinced that if he can find a career-best fitness level, that he still has value. A big man that can move like he moves, he is valuable. He's too big and mobile not to if he can get in great shape. So we made the decision to open up roster spots and we have a little bit of flexibility and we wish both of them well." Be that as it may, could the window be closing on Brown's career? Brown is 31 years old and is a 12-year vet (guaranteed $3 million this season). The 6-foot-11, 270-pound center has played for Washington, the Los Angeles Lakers, Memphis, Detroit, Charlotte, Golden State and now Philadelphia. In 22 games with the Sixers, Brown — who has always been tagged with a poor work-ethic label — averaged 1.9 points and 3.4 rebounds in 12.2 minutes. His best season in the league came during the 2003-04 season, when Brown averaged 10.9 points and 7.4 rebounds per game. Just last month, the media in Philadelphia wondered why Brown was still on the team to begin with. The question obviously drew the ire of GM Sam Hinkie, but now weeks later Hinkie essentially makes the move knowing in the back of his head it was best for the Sixers in the long run. As for Brown, it will be interesting to see which team will take a flier on the big man next….if any.